24-hour forecast: Sunny with some cloudy spells today and cloudy at times tonight. A few showers and isolated thunderstorms will occur mostly over southern and along some coastal areas this morning and tonight and over inland areas this afternoon. General Outlook: Some cloudy spells with a few showers and isolated thunderstorms over northern and inland areas during Monday and over the south and coast Monday night. 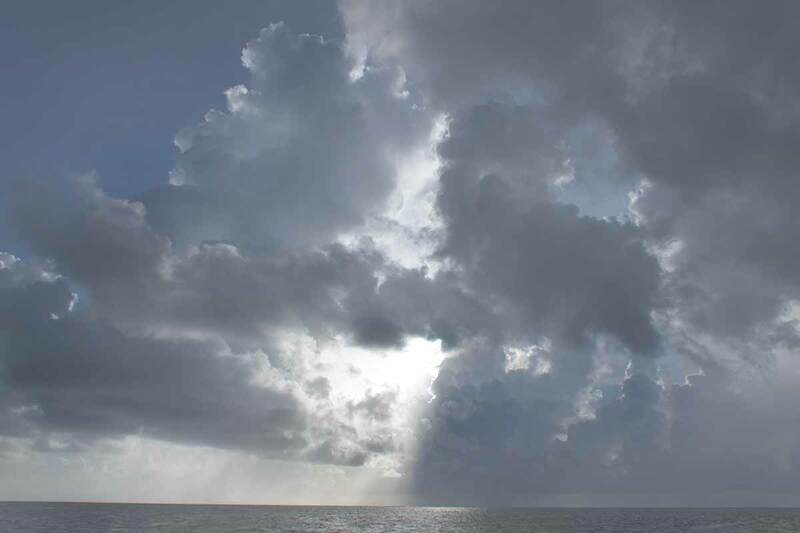 Today E 5-15 kts Light Chop-Choppy 3-4 ft ISOLATED SHOWERS AND ISOLATED THUNDERSTORMS. Tonight E 5-15 kts Light Chop-Choppy 3-4 ft A FEW SHOWERS AND ISOLATED THUNDERSTORMS MOSTLY SOUTH. Tomorrow E-SE 10-20 kts Choppy 3-5 ft A FEW SHOWERS AND ISOLATED THUNDERSTORMS MOSTLY NORTH. Outlook E-SE 10-20 kts Moderate 4-6 ft A FEW SHOWERS MOSTLY SOUTH. 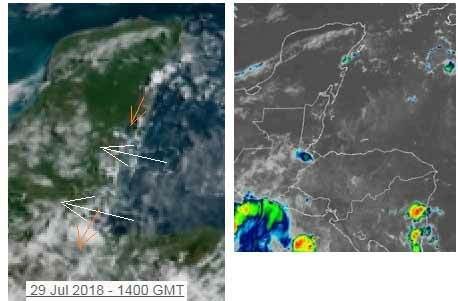 Shallow moisture with a tropical wave in the northwest Caribbean together with a divergent environment aloft are supporting the convection over Cuba, the Yucatan Channel, and the Yucatan Peninsula. In the southwest Caribbean, the EPAC's monsoon trough supports scattered moderate to isolated strong convection over Costa Rica and Panama. 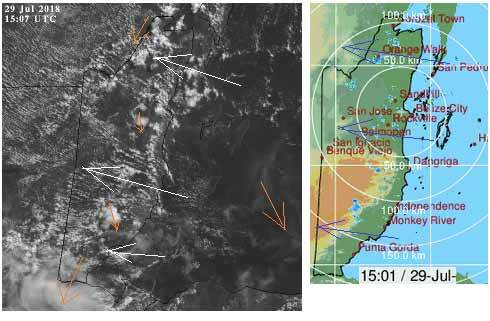 Elsewhere, scattered moderate convection is over Hispaniola and Jamaica mostly due to an upper-level low centered over Hispaniola near 19N71W. Fresh to strong winds are forecast for the south-central basin through Wed.
On Ambergris Caye this morning I couldn't argue with the forecast of ISOLATED SHOWERS AND ISOLATED THUNDERSTORMS. The sea around our barrier reef is calm and the breeze is from the East-SE at 10 mph. We have an expected high temperature of 89 f.
There have been a number of swellups around us over night, caused by the high level from the north. The easterly Caribbean clouds are very chunky this morning, so there are isolated rain showers in many places, mainly just inland from the coast. 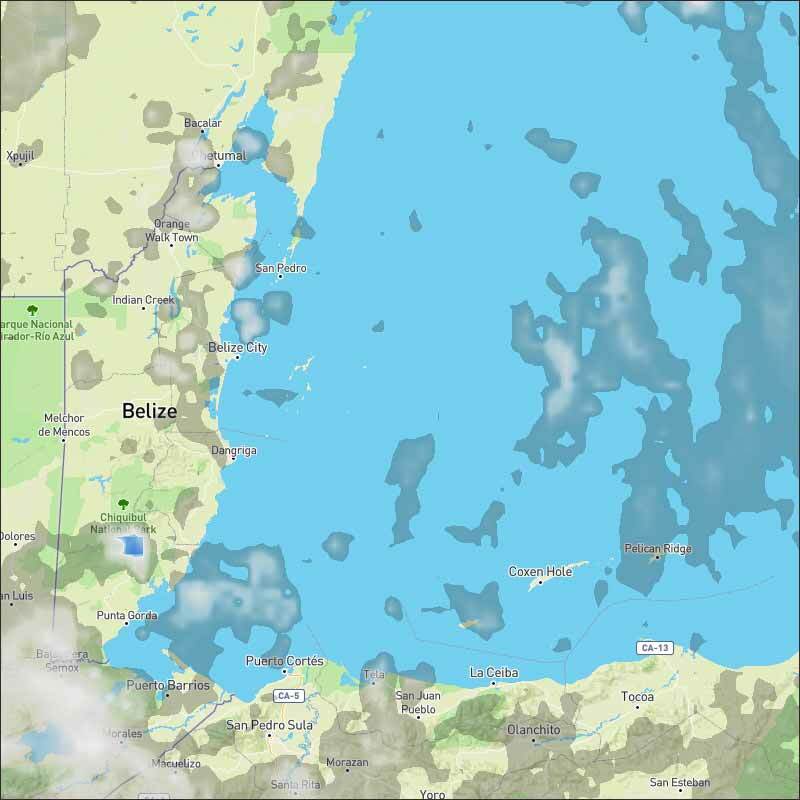 Looks like today will be mainly sunny, but with significant clouds from time to time, some could bring rain.